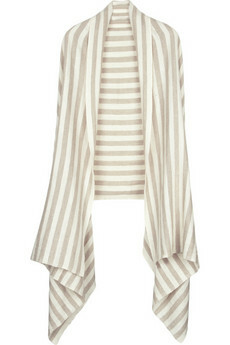 Stripes are making a massive comeback, precipitated by fashion’s obsession with all things nautical. I love a stripey look. It’s such a simple one, but with classic Parisian flair. Stripes often get a bad reputation though, and it is worth bearing in mind that not all stripes suit all bodies. Stripes do have the ability to alter our shapes, so if you are tall (and don’t want to appear taller) avoid vertical stripes and if you’re curvy (and don’t want to appear curvier) avoid horizontal stripes. The easiest striped item to add to your wardrobe is the striped tee. It’ll soon becomes your favourite! If you’re wary of the trend, team it with a blazer or cardi to break up the stripes, or leave a little striped hem peeking out from under a jersey. 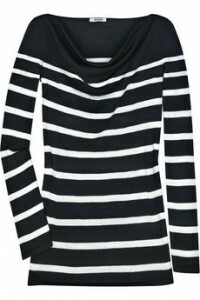 Try layering your striped tee under a sweater or tank, or wear it with a scarf, which will prevent the stripes going all the way across the body. I like my striped shirts, tees or cardis to be a little oversized (one size up than normal), so that the stripes are broken up a bit. The worst look is a too-tight tee where the stripes are stretched into waves over the bust and/or tummy. Steer clear! To find out more about Jenny and her store Friend with Jenny, visit her website or blog.